One bright spot that has endeared boxing fans from around the globe are the championship fights that finish up each calendar year from Japan. The popular New Year’s Eve celebrations are shared with the rest of the world with their most talented title holders and hopefuls showcased. This year is no different and on some level more anticipated than year’s past with the level of competition elevated, and more eyes ready to watch as streaming services pick up the action for the West. The end of an era is commencing in Japan as the Heisei period comes to a close once Emperor Akihito abdicates next year, marking the end of what’s been referred to as “the lost” decades, that started in 1989. As this will be the last New Year’s Eve of this period we already see positive shifts on all societal fronts including boxing, to a more welcoming attitude towards outsiders, as the country begins to once again open its doors to the world ahead of the 2020 Tokyo Olympics, that may or may not include the sport of boxing. Going abroad more often is one of those positive shifts that you can expect from the fighting sons of the Far East during the new era which has yet to be named. 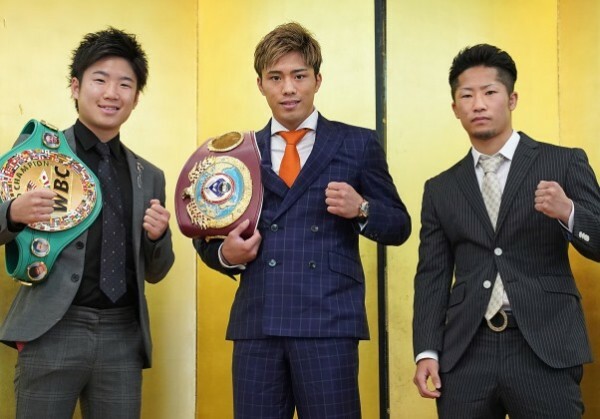 Kazuto Ioka and Hiroto Kyoguchi will spearhead a Japanese delegation to Macau on New Year’s Eve while fan favorite Ken Shiro, joins Masayuki Ito and Takuma Inoue in a Tokyo campaign that will light the fuse on a string of six title fights over a forty-eight hour period. The festivities continue with Floyd Mayweather making an exhibitive appearance in Saitama, just beyond the city limits from the nation’s capitol. Breaking down your end of the year boxing binge, No Sparring brings you comprehensive coverage of the storylines that didn’t get lost in translation. Masayuki makes his first defense of the title he won when he defeated Christopher Diaz last summer in Florida for the vacant strap. The challenger Chuprakov is ranked #1 by the WBO and will be fighting abroad for the first time in his career. With both fighter’s at a 50% KO ratio, don’t expect a quick finish. A center of the ring slugfest that will test their stamina and mental toughness could play out over thirty-six minutes, though expect the middle to later rounds to favor the more battle tested and proven Ito. The two fighters headline the night’s action that is expected to be picked up by ESPN+. In what amounts to nothing more than a stay busy bout, Ken Shiro will grace the ring once again and should fashionably end the visiting Mexican early, while retaining his title for a fifth successful defense in the process. Staying active is a staple in Japan, and fighting for the third time this year for Shiro is a welcome contrast to some other boxing champions like Gary Russell Jr. Ken Shiro has unification opportunities next year and should see his star rise even further after this victory, if it ends quick enough. In what is easily the most interesting bout on paper for the card, Takuma Inoue continues his quest for championship gold when he shares the ring opposite the experienced but never tested Petch Chitpattana, who will be fighting outside of Thailand for the first time. Inoue has been upping his level of opposition incrementally since he turned pro, while Petch has feasted on young or low-tier opposition. The winner will get the chance to become full champion and face the winner of Nordine Oubaali versus Rau’shee Warren, which is scheduled to take place next month. The WBC has made an unusual situation that kept their title from being included in the World Boxing Super Series at the bantamweight level, as the title has remained vacant since February. Inoue will have the support of his older brother Naoya from his corner and can use his experience from other high profile cards to his advantage against Petch. In what has more storylines than a samurai drama, Kazuto Ioka will continue his comeback against the veteran Nietes on the day he helped turn into a boxing mainstay for his countrymen. Headlining the holiday for a record seventh time, Ioka looks to become Japan’s first four division champion and advance in the process to SuperFly 4 next spring. The bout takes place in Macau on the backdrop that Ioka currently isn’t eligible to fight inside Japan, though he’s now training in Tokyo at former junior lightweight champion Takashi Uchiyama’s newly opened boxing gym. Family drama that includes a recently divorced celebrity wife who didn’t want to see him fight again, a father not a fan of her career advice yet caught in his own professional troubles as a purported member of the yakuza, creates headlines and headaches for Ioka who welcomes another fight abroad away from the notoriety. Nietes is also looking to become a four division champion. He fought to a draw on the SuperFly 3 card last September for the same belt at stake on this night. Having shared the card with Ioka, both fighter’s look to be in similar conditions though the younger Ioka carries the speed advantage. A true treat for boxing fans in this one. Budler won the Ring/IBF/WBA titles last spring against Kyoguchi’s stablemate, Ryochi Taguchi. The hope for the now former champion was to gain an immediate rematch with Budler, who opted to vacate the IBF title rather than fight a mandatory for short money. Taguchi admitted to this writer that he was having trouble with the weight and will instead look to campaign at the flyweight division next year. That left Kyoguchi, hot on the trail of second division championship, free and clear to challenge Budler, after the twenty-five year old debuted at the weight in impressive fashion last September. Kyoguchi has ben vocal that he’d like to face-off against Ken Shiro in a unification once he gains a junior flyweight title. The South African Budler looks to spoil any potential domestic showdown between the two popular Japanese pugilists and will be in great shape to do so, having rested since May, but already having two wins under his belt for the year. Mthalane is riding a thirteen fight win streak since 2008, including a TKO performance against the highly regarded Zolani Tete. He last loss to Nonito Donaire by TKO. The South African is highly skilled and has to be the favorite against the younger and less tested Osaka native, Sakamoto. Both fighter’s pack a heavy punch and should offer lots of action. A three round boxing exhibition is set to take place between the future hall of famer and the young stud from Japan known more for his professional kickboxing abilities rather than any boxing. A fighter nonetheless, and a smaller one at that, will gain a piece of the worldwide spotlight and has a chance to bring himself a large foreign contingent of fans should he be able to do anything of substance at all during the nine minute foray. Floyd Mayweather returning to some form of action wasn’t exactly the most sought after development boxing fans were hoping for, and surely had they been, this wasn’t what they wanted. The fighter who coined the nickname “Money” for himself, has always been an expert at sizable money grabs with limited risk, and this instance is no different. With a large marketing campaign set to dwarf that of the Ioka-Nietes card, expect a curious audience to tune in for the event. “The Money Team” will bring a lively atmosphere to Tokyo and Saitama, that in any event, will be entertaining.